Ni No Kuni: Wrath of the White Witch is a highly publicized jRPG for the PS3 made by an excellent studio, Level 5, animated by Studio Ghibli, and with music by Joe Hisaishi. 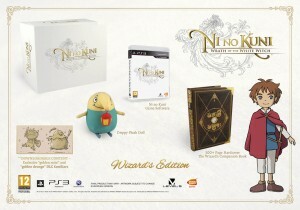 Pictured above is the Wizard Edition of the game, a collector’s edition scheduled for release on January 22nd 2013 that was only sold in July 2012 as part of a Kickstarter-like campaign by Namco, and again on January 17th 2012, possibly because people canceled their orders or they found that they had made extras. I, like so many others, managed to snag a copy on the 17th, canceling my amazon pre-order that was guaranteed to be on my doorstep on the 22nd. As the 22nd rolled around, I received no update on my order status. This lack of information continued until 5:13 PM CST when I received notification that my order had been canceled for no reason. I will admit I was rather distraught, not only that I had to wait to play this game, but that I would be waiting another week to receive my refund. I chose to dig deeper into this issue, deeper than even other websites have reported similar issues today. The story hitting the internet is vilifying PlayCanada and the fact that they ordered 200+ copies back in July 2012. I do not agree with that because. as a business, they decided to take that risk and it has paid off. They increased their prices because demand increased, and that is part of business. I do not find it nice of them to do, but they were out at least a 2000 dollar investment for the better part of a year, and that is a lot of capital to leave waiting. There is also no guarantee that PlayCanada will even get all 200+ of their copies. The real shocking story is not of PlayCanada and their scalping of Wizard editions, heinous though it may be. The real story comes from the fact that some people who ordered on the 17th were given cancellations on Monday, due to lack of stock. When these people complained, DigitalRiver (The company that handles Namco-Bandai’s e-storefront) assured them that stock was still in place, and sent them an email with a backdoor link to reorder their copies. These links were then leaked on neogaf.com and cheapassgamer.com where people were purchasing them up until January 23rd. People who used this backdoor were placed first in the shipping queue, meaning they were being shipped before people who ordered on the 17th, and possibly even people who ordered in July 2012. If you have received a cancellation email in the past 24 hours, it was most likely due to this snafu, which DigitalRiver has not even admitted to. My personal opinions of this situation and what you can do to help, or can do to attempt to collect on your cancellation continues past this point. There is a petition on change.org asking Namco to print more copies for their customers here. There is a Facebook dedicated to this issue here. IF you did order from DigitalRiver and got canceled, the BBB has a website for filing complaints here. Personally, I understand that mistakes happen, and I understand that the likelihood of me getting a Wizard Edition is quite small, and I accept that. In fact, if they had just accidentally had more orders, and I got unlucky, I am okay with that. While I do not like what PlayCanada did, that is how business works. The complaint I have is with a lack of customer service, a poor method of relisting an item, which should have been done over the phone, since DigitalRiver’s call center is open 24 hours. I have a problem with people who missed out on both windows to order the item who snuck in at the last-minute because someone gave them a link they should not have had, while people who paid over 120 dollars got the shaft. I have decided that I will not be purchasing anymore Namco-Bandai products until they issue a reprint for customers who were robbed of their items, or come out and admit that they messed up by giving DigitalRiver control of their store, and replace DigitalRiver with another company who knows how to do business. Until such time as that happens, I will get my “Tales of xxxxx” fix by buying used, as I will when buying Ni No Kuni. I would rather Amazon, Best Buy or even Gamestop make a profit than Namco Bandai after this. Web of Lies: EA Petition Being Vote Stuffed with Spambots? Thank you for shedding light on our plight Tristan! Something completely wrong happened here and it’s mainly in Digital River’s lap. Namco should hero up and make more or fulfill the cancelled orders somehow. It’s not like the 1/17 preorders or even the earlier periods preorders should’ve been canned like that. Digital River told people if you get in within the first 2 hours of the overselling, you’re fine, then later they said it sold out in less than a minute, then a hoard of people got in orders and confirmations immediately on 1/23 and 1/24, and some weren’t even charged for their copies!